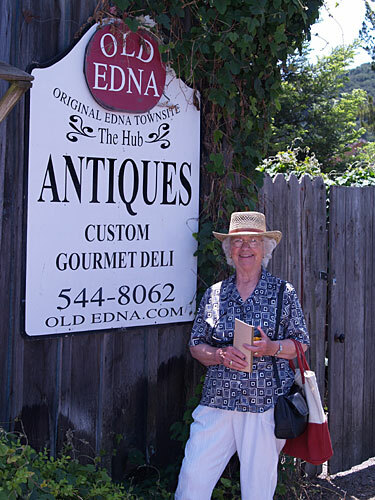 I took my mom, Edna, to Old Edna for Mother’s Day. She’d seen an article about it in Westways magazine and wanted to visit a town with her name. Things got off to a slow start. As mentioned yesterday, I had horrible allergies and slept badly the night before, so I was feeling pretty awful when we hit the road a little before nine a.m. In fact, I’d considered postponing the trip, but I knew Mom was really looking forward to it, and it was Mother’s Day, so I wanted to do it if at all possible. But it was a nice, sunny day and my head had cleared up a little after a long, hot shower, so off we went. We took Highway 58 through Bakersfield, then 46 West across California. That’s my usual route up to the Bay Area as far as I-5, so that part was familiar to me. I stopped at the gas station/food mart at 46 and 5 for a rest stop, bought a 20-oz Coke to keep me going and took another dose of Nasalcrom, which finally made it possible to breathe through my nose without a struggle, and we continued on 46 toward the ocean. Route 46 is a long, mostly straight two-lane highway through central California. We first passed through Lost Hills, with its oil fields. There’s a road there called Brown Material Road. I… don’t want to know exactly what Brown Material it’s named after. Then there are vast fields of tumbleweeds, piled up against fences and in mounds wherever the wind has tossed them. Occasionally, there are cattle grazing on the hillsides, and wildflowers dotting the shoulders of the road. It was a lovely drive, not much traffic, beautiful scenery. Eventually, we reached Paso Robles, where we got on 101 South and drove another twenty miles or so to San Luis Obispo. Then we got off the freeway and went another five miles or so down CA-227 until we reached Old Edna! 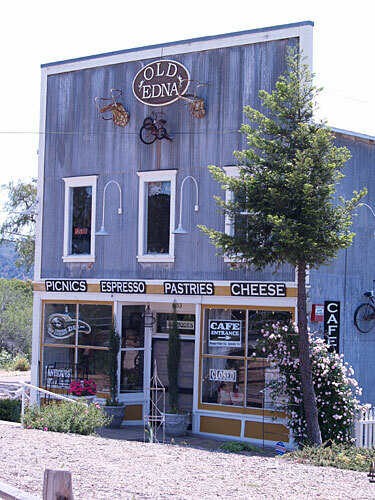 Old Edna is a small compound along the road with an antique store and café, a few historical outbuildings, and a bed and breakfast. It’s charming and rustic and full of many signs saying “Old Edna,” all of which I photographed my mother standing next to. Our first stop was the Café, which, very luckily, was open—there was a sign on the door saying, “Now open on Sundays! Beginning May 11!” So we had, totally by chance, chosen the first Sunday they were actually open to visit. No, it never occurred to me to call ahead and make sure of their hours. Mom says she thought of it, but didn’t. So we’d taken a chance and got lucky. The antique store was closed, but we weren’t there for shopping, and we could see most of it from the café, which is in the same building with a half-wall separating them. The café was very busy, and they were rapidly running out of most of their food. I had a fresh Mozzarella sandwich with pesto on focaccia and a walnut-date bar for lunch, very yummy. I had also forgotten to make sure I had enough cash with me, but fortunately I had enough to pay for our lunches and buy Mom a few postcards. Then we wandered around a bit and looked at the site and took pictures. Mom told the owners she was 88 years old and her name was Edna, so she was Old Edna, too! They thought it was very cool that we would drive all the way from Tehachapi just to see them. They told us about a nearby winery called Edna Valley Vineyards, so when we’d seen all there was to see at Old Edna, we headed off there to buy some Edna Valley wine for Mom to give to people. The winery was also very beautiful and picturesque. Mom bought three bottles of Chardonnay, a tee-shirt, and a postcard. I bought a cap and some chocolates. By then, it was 2 p.m., and time to head home. We made a couple of stops along the way, at a rest area, and then at Murray Family Farms. I picked up some local raw honey, which I’ve heard is good for pollen allergies, and used it in my morning cocoa. Pretty tasty! We’ll see if it actually does any good for my allergies. And I got some Rainier cherries, which are my favorite cherries, yum! We got home around 6 p.m., tired but happy. My mom really enjoyed her day, so I’m glad we went, even though I was feeling pretty yucky a lot of the time. I had a good time, too. Here are a few photos of Old Edna.